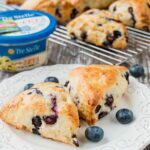 These sweet and savory scones are tender and buttery with the taste of creamy Feta cheese and fresh blueberry goodness baked in. They are nicely golden and crispy on the outside with an incredibly soft and moist center. This is a sponsored post. 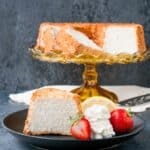 I had the wonderful opportunity to work with Tre Stelle to create this recipe for you. Though monetary compensation was received, all opinions are my own. We’re in the full swing of summer here in Ontario. Flowers are in full bloom, the kids are off from school, and the weather has been great! For over 50 years, Tre Stelle has been a proud supporter of Canadian Dairy Farmers, producing only the finest quality and award-winning cheese. Like their Feta cheese, which is made from 100% Canadian cow’s milk. It has a delightfully mild taste. It’s slightly tangy and not too salty, which makes it an ideal everyday cheese. You can enjoy it with your soups, salads, sandwiches, pastas, meats, pretty much anything. It’s also a cheese that pairs well with fruit because of its mild-creamy taste. 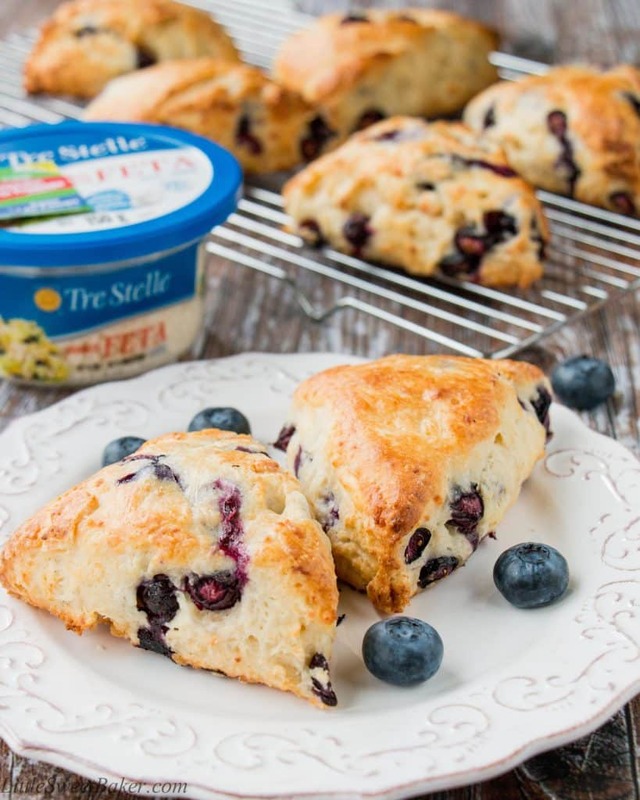 This easy scone recipe only takes 30 minutes of prep (that’s including chill time) and 20 minutes to bake. It’s all made in one bowl and completely by hand. You simply toss together your dry ingredients, cut in your butter, and add in the blueberries and Feta cheese. Then you stir in your wet ingredients, and knead and pat out the dough. Cut the dough into wedges and chill it in the fridge while your oven heats up. Chilling the dough allows the gluten in the flour to relax, which makes the scones more tender and produces a higher rise. It also solidifies the fat which makes the scones flakier. 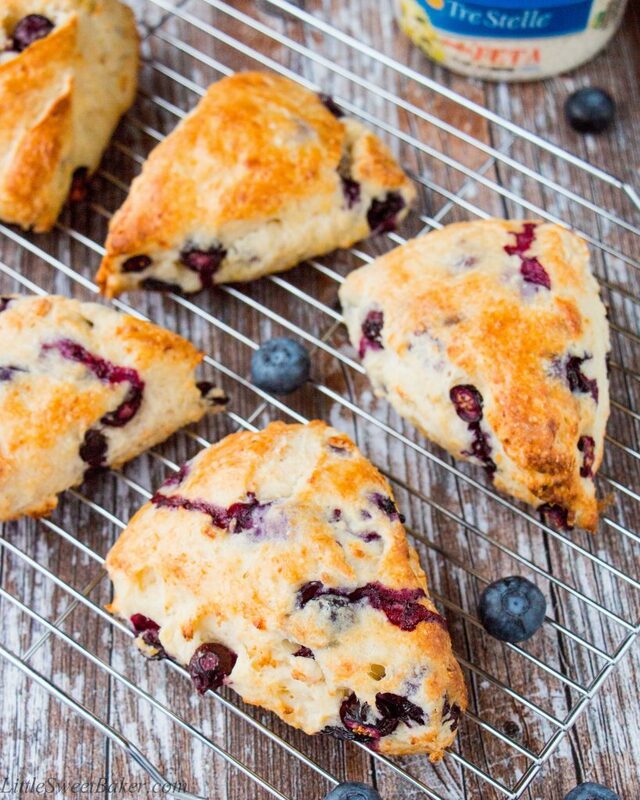 These Feta cheese and blueberry scones are excellent served for breakfast, brunch or as a snack. They are soft and fluffy on the inside, golden on the outside and have crispy crust. 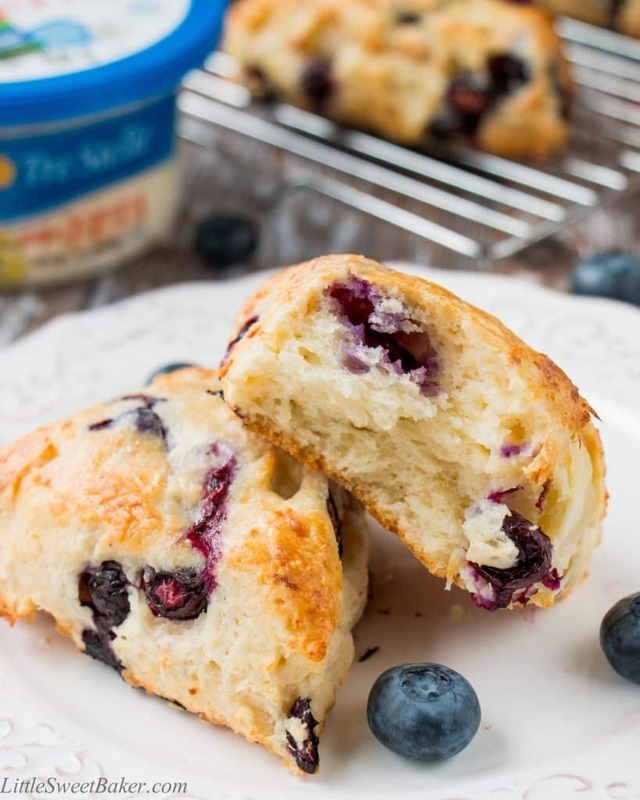 The taste is lightly sweet and salty with a rich creamy cheese flavor and there are bursts of fresh blueberries throughout the scone. 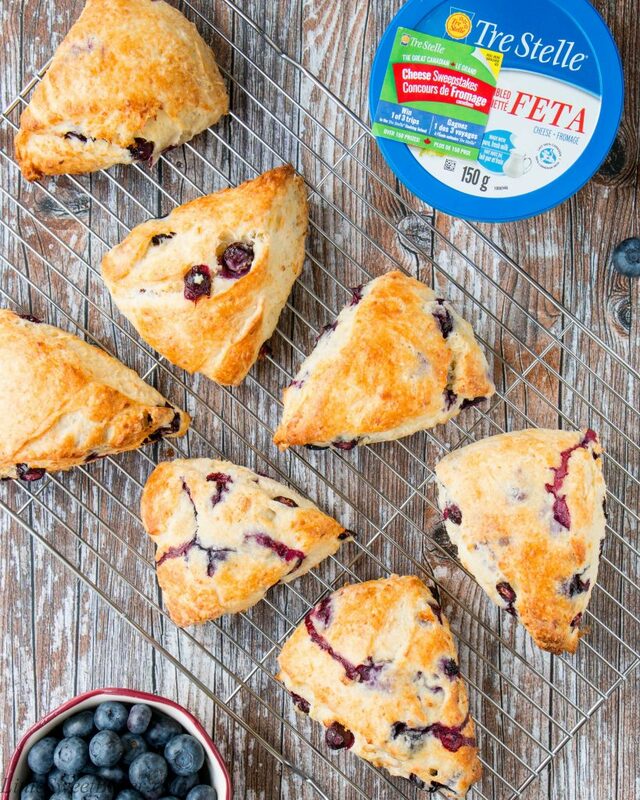 These sweet and savory scones are tender and buttery with the taste of creamy Feta cheese and fresh blueberry goodness baked in. Cut in the butter with a pastry cutter or fork until it resembles coarse meal. Stir in the blueberries and Feta cheese. Set aside. In a measuring cup, whisk together the buttermilk and egg. Scrape the dough onto a generously floured work surface. With floured hands, turn to coat all surfaces with flour. Gently knead 3-4 times to work the dough into a ball. Then pat out into an 8″ circle. Cut into 8 wedges and place 2″ apart onto a parchment paper lined baking sheet. Chill uncovered in the fridge for 20 minutes while you preheat your oven to 400F. The scones are best enjoyed the day of. Leftovers can be stored wrapped up in the fridge for up to 3 days. To re-heat, place on a baking sheet, lightly tent with foil, and warm for 10 minutes at 350F.